Using your smartphone, tablet to watch and listen to Stream live recorded video 24/7 with 2-way audio from anywhere at anytime with our "eyeplus" free app. Quick WiFi Setup via iPhone or Android Smartphone, just plug in the power cable, download the App and set it up via your iPhone or Andriod smartphone, remote access to the IP camera on iPhone/ iPad/ Android phone/ tablet/ MAC/PC, keep an eye on your loves and belongs anywhere anytime. Supports Cloud Storage to avoid the risk of losing footage from an SD card, ensure all your videos are safe, secure and protected. We provide the most efficient compression and the highest protection of data, so you can be sure that your footage is safe and secure. 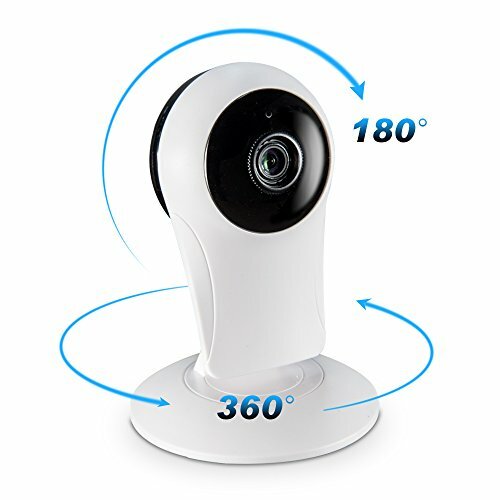 Special Mini Designed IP camera, adjustable horizontal angle 360°and vertical angle 180°, can be installed on any situation and location. Meanwhile it can provide extremely smooth video streaming with 720p HD quality and 4X Digital Zoom to offer more detailed views. Receive real-time Activity Alerts while you're out,push alerts via mobile phones and email . See and hear in perfect detail with this security camera. Experience a new sense of security with 720P HD video, night vision, and 2-way audio. Meanwhile alerts you whenever motion or sound is detected and notifies you with instant alerts so you never miss an important moment again. Record to a microSD memory card or on your phone, so you can easily review the footage from the past. Supports up to 32GB. Supports Cloud Storage to avoid the risk of losing footage from an SD card, ensure all your videos are safe, secure and protected. The first month cloud storage service is for your free trial, also you can purchase this service if you feel great about this service with 6 USD per month via”eyeplus” APP . Set-up in less than 3 simple steps! Place the Camera wherever needed on your wall, on a shelf, etc. Download the “eyeplus” App. Plug in the power cable. Connect to your phone and then real-time stream video will show on your device.